Miguel de Cervantes's Novelas ejemplares, a collection of short stories in the tradition of Boccaccio, has a solid foundation in the history of Golden Age Spain. 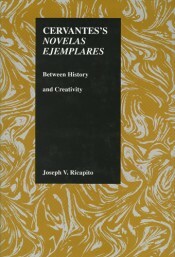 Joseph V Ricapito studies Cervantes's work from the point of view of "novelized history" or "history novelized." In line with current New Historical thought, he argues that literary production is largely from life and experience, and that Cervantes was acutely aware of the problems of his day.The novelas offer us a glimpse of Cervantes's Spain and include a cataloguing of the social, political, and historical problems of the time. 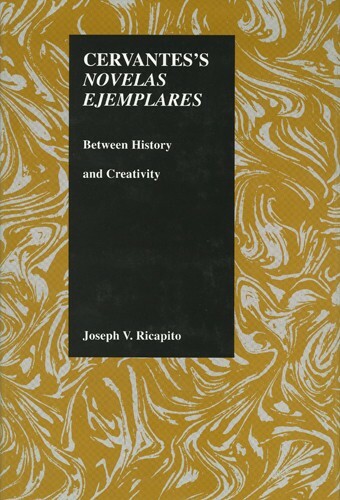 Ricapitc shows how Cervantes fictionalizes the problems of unpopular minorities like Gypsies and conversos (Jewish converts to Catholicism); the difficulties of social mobility in a Christian setting; the presence in society of differing and even outlandish individuals; and the oppressive role of honor, which was popularized by Lope de Vega and later formed a leitmotiv of Spanish drama. In his analysis of Cervantes's creative response to history, Ricapito relates the novelas to the works of Lope de Vega and Mateo Aleman and shows how Cervantes brings to life many literary topoi and places them in a realistic, credible framework in which the historical presence is strongly felt. In Cervantes's treatment of Spain's waning prestige in Europe, we see his vision of human behavior. His view is stern, his critique is sharp, and he is sensitive to external stimuli. JOSEPH RICAPITO Professor of Comparative Literature. Director of Italian program. Ph.D. University of California, Los Angeles, 1966 (225) 578-6616 Dr. Joseph V. Ricapito, Yenni Distinguished Professor, was the invited Distinguished Visiting Lecturer in Honors and the Eastern Washington University, November, 2003; Dr. Joseph V. Ricapito has been chosen as the 2004 Cervantes Lecturer for the Cervantes Lectureship at Fordham University, April 28, 2004. Teaching: Spanish Golden Age literature. Picaresque literature within an interdisciplinary historical and literary context. Renaissance humanism as a cross-cultural dialogue between Spain and Italy. Poetry of Petrarch. Medieval and Early Modern Italian literature. Research interests. Authors of the Italian Renaissance and Spanish Golden Age: Cervantes and Machiavelli. Renaissance thought as cross-cultural. Writing and publishing my own poetic works. Approach: The grounding of all the literary artifacts within a historical and cultural context constitutes my essential point of departure in any literary analysis.